Let’s have a little chat! I’ve been doing this blogging thing for seven years now, can you believe it? It started off as a deeply personal way to share my story. 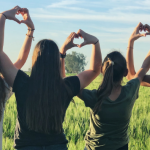 The good, the bad, the ugly of my journey toward loving myself. This work has become such a part of me, especially lately. It’s part of what keeps me sane and it’s part of my self-care. In the last year, I’ve started to re-discover my spirituality. An essential part of that is being of service to others. I’ve realized my ability to be a catalyst for change and healing for other people. There’s that part of me that shies away from it as not being worthy or not being ready, but then there’s that part of me that sticks her chest out, straightens her shoulders, and says let’s do this. So I ask, how can I be of service to you? I truly want to know and I want to give to this community in a way that helps you grow, transform, and heal, and in turn, helps me to do all of those things as well. Each time I enter that cauldron of creation – I come out a different person. It’s a lovely cycle. 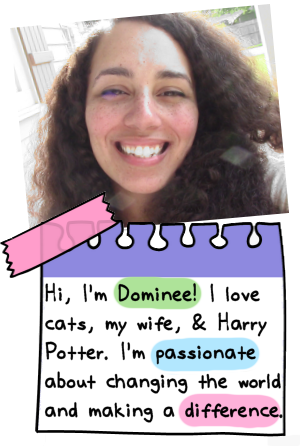 If there’s a product, service, ebook, ecourse, freebie you’d like to see me create – tell me! 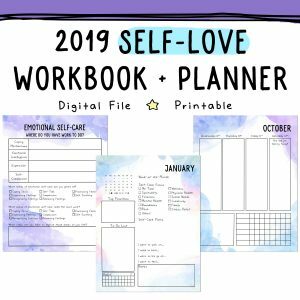 I want to go back to making free printables that can complement the Self-Love Workbook and my Anxiety Workbook or that can be used on their own. 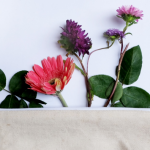 I asked for your opinions in the SoulSisterhood on what types of worksheets you want to see and it was overwhelmingly – more self-care. 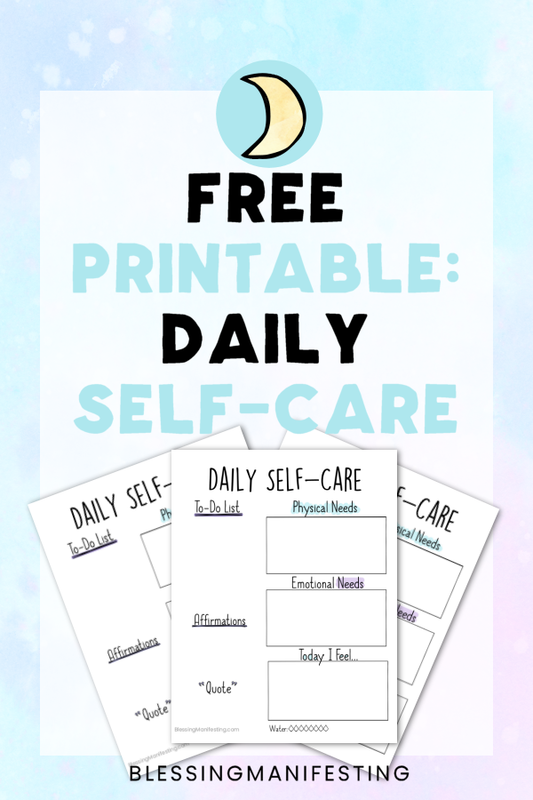 My plan is to share a new printable every two weeks I can share a new printable with you all! 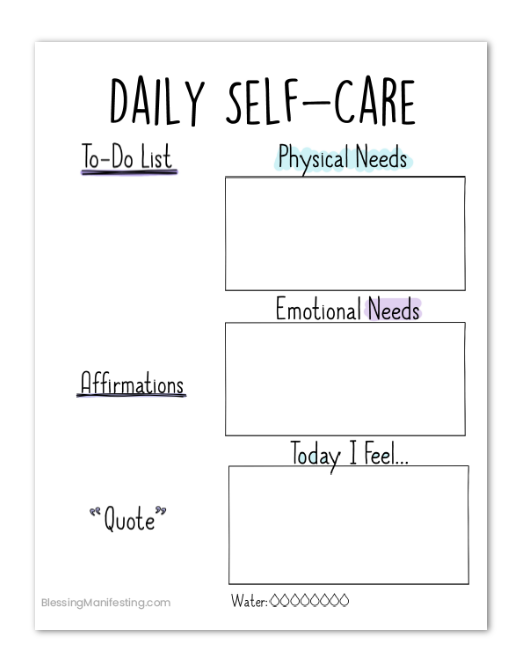 Today, I created this Daily Self-Care Worksheet. 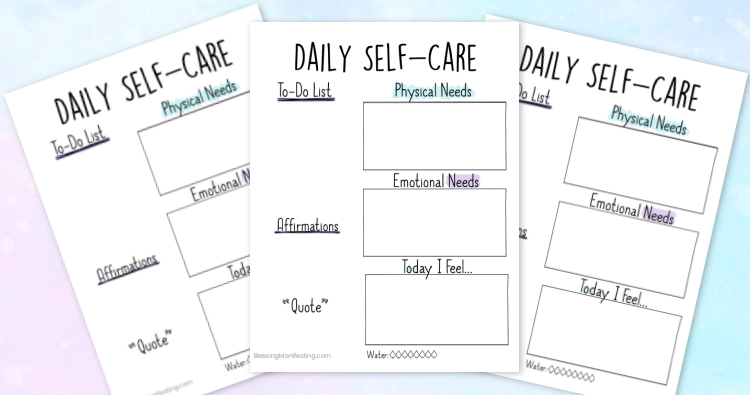 This worksheet is great for those days when you really want to focus on your self-care. There’s a section for your goals – self-care goals for the day or other goals – you choose. A daily affirmation – something encouraging you want to tell yourself. A quote – give yourself a little inspiration (or you can pull a quick oracle/tarot card for yourself and write down the message!) Then we have physical needs – this is perfect to make your daily goals for sleep, diet, movement – or whatever else benefits you physically. Then we have your emotional needs – time management, something to relieve stress or relax, time to yourself – make a plan! Finally, we have a place to check in with your feelings! Next Post Teen Suicide Prevention: Have you had “The Talk”?